This photo provided by Zoetis shows the drug Sileo, the first medicine approved for treating dogs' anxiety over loud noises, a widespread problem linked to destruction of property, terrified dogs running away and even life-threatening injuries to some. 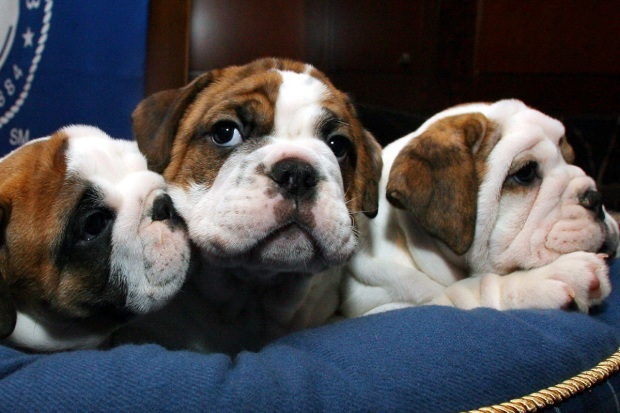 Fido and Spot may not have to cower under the bed this summer when fireworks and thunderstorms hit. The first prescription veterinary medicine for treating anxiety over loud noises — a widespread problem that can send dogs running away in terror and harm both themselves and property — will soon hit the market. 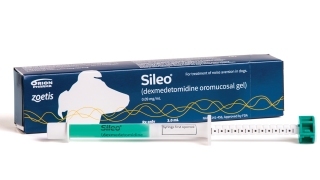 Veterinary medicine maker Zoetis Inc. of Florham Park, New Jersey, said Monday that recently approved Sileo will be available through veterinarians within a week. Dr. Chris Pachel, a veterinary behaviorist at the Animal Behavior Clinic in Portland, Oregon, welcomes a medicine tested specifically on dogs that works rapidly but wears off within hours — like by the time a thunderstorm is over. "There's always a need for new options," said Pachel, who has reviewed some testing data on Sileo but isn't affiliated with Zoetis. "I have seen the absolutely worst things that can happen with noise anxiety," Dr. J. Michael McFarland, head of U.S. pet marketing at Zoetis, who formerly worked at multiple animal hospitals. Current treatments range from human anti-anxiety pills such as Xanax and tranquilizers that sedate dogs for many hours, but don't necessarily calm them, to behavioral treatments. Those include confining the dog to a small room or portable kennel, or trying to desensitize dogs by repeatedly exposing them to increasingly loud noise. Pachel said those treatments or combinations of them work for many dogs, but the tranquilizers can take days to wear off and anti-anxiety pills — many only tested on people — can cause appetite problems, upset stomach and, rarely, abnormal heartbeats if the dose isn't right. Sileo works by blocking norepinephrine, a brain chemical similar to adrenaline that pumps up anxiety. It comes in prefilled plastic syringes with a dial for setting a precise dose according to the dog's weight. The needleless syringe is placed between the dog's gum and lip. A little push ejects a small amount of gel that's absorbed by the tissue lining the dog's cheek, which limits how much circulates in the dog's body at a time while enabling the medicine to start working within 30 to 60 minutes. It works for two to three hours, said McFarland, who said he has used Sileo with good results on his Finnish Lapphund. Dr. Barbara Sherman, a professor at North Carolina State University who runs its animal behavioral medicine clinic, reviewed detailed data on Sileo while serving on an advisory board at Zoetis and found its effectiveness "impressive." She said side effects were benign and thinks that for some dogs, it will be easier to administer than pills. In testing conducted for the company on 182 pet beagles on New Year's Eve, 75 percent of their owners rated its effect good or excellent, compared with 33 percent whose dogs got a placebo. Side effects were rare and minor.